Handbook of Canine and Feline Emergency Protocols, Second Edition offers practical step-by-step guidance to managing emergency cases in small animal practice. Presenting more than 165 complete protocols for triaging, stabilizing, and managing emergent patients, the book is designed for fast access in an emergency situation, with a spiral binding and tabs to make it easy to flip to the relevant section. An ideal resource for veterinary practitioners seeking a quick reference for dog and cat emergencies, this Second Edition provides enhanced imaging information to increase the book’s diagnostic usefulness and full updates throughout. Logically organized alphabetically by category of emergency, the book includes useful chapters on procedures, shock, toxicology, and trauma in addition to a procedures chapter. Video clips, additional images, review questions, formula calculations, and quick reference guides are available on a companion website. 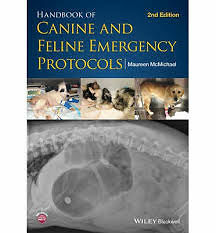 Handbook of Canine and Feline Emergency Protocols, Second Edition provides a user-friendly daily reference for any small animal practitioner.